"Brewed with six malts of Belgian & British origin. Bourbon in color with a very complex and interesting malt profile. Matured in 9 & 10 year old bourbon barrels for 2-4 months. Bright aromas of bourbon, fresh baked bread, caramel, and oak. Velvety texture, rich malt and bourbon flavours with an enticingly warm bourbon finish. 10% alc/vol 40 IBU's"
Bottle: Poured a deep amber color ale with a small foamy head with limited retention and minimal lacing. Aroma consists of caramelized malt with some bourbon notes and some woody notes. Taste is a weird mix between some woody notes with some bourbon some caramelized malt notes though not as much residual sugars as I would have expected. Body is about average with good carbonation and some warming alcohol. Disappointed by this beer which lacks the balance I was hoping for and veers close to the messy category. On tap during the Hop and Vine event. The beer pours a tawny, cloudy brown color with good head retention and decent lacing. This beer has the look of a beer that has seen a bit of barrel aging in its time. The nose is intense and a bit unusual, as I pick up noticeable bourbon (of course), brown sugar, plum, light sour and vanilla. The bourbon does not overpower the rest of the aroma components in this beer, which I think is a good thing. On the palate, this beer is just a treat. The beer is fairly sweet and rich, but has enough bourbon and dark fruit to keep the sweetness from coming across as too much. Mouthfeel is medium bodied, with a long, rich, brown sugar and vanilla infused finish. This beer carries its 10% abv. very well, and is not at all heavy, hot or tiring on the finish. You can certainly tell it's up there, and I'm not sure I'd ever want more than a single glass at a sitting, but this is definitely a very nice beer that I wouldn't hesitate to order again. On tap at Baileys Taproom. A - Clear bronze amber color, light head. T- Smooth vanilla, sweet malts, brown sugar, bittersweet chocolate, nice bourbon finish, a bit hot. D - very tasty beer. I wish it was bottled. PAPPY BARRELS. A difficult beer to categorize or describe - pretty big bodied, caramel and toffee are the dominant flavors - bourbon is percolating, but not particularly refined. Brown sugar and molasses contribute additional weight and sweetness. I'm not sure about this one - some nice things going on, but kind of a mish-mash and the barrel aging really was pretty sloppy in my opinion. A snifter (a paltry $3? what???) served at The Hop & Vine, one day after a big Block 15 bash. Thanks to Yetta for the pour, despite the bar side not opening for well over an hour ~ glad there was still some left on-tap, even after bottles were long gone. A: For lack of a better descriptor, this looks like 'bourbon' - a deep brown-orange that shows very little carbonation through its slight haziness. Barely a a 1/4" of khaki cream breaks apart quickly; 'lace' is a polka dot scattering. T: Notable flavors of richly sweet and amply spiced bourbon; it's very straightforward with the oak and the spice. A curious fruitiness (apple) with toasted nuts and a little toffee. Dessert-y sugars and something deeper and darker, light cocoa and charred wood. It's complex know, but you have to believe there's much more to this given some time to relax. D: A beer with 'good bones', but not an entirely drinkable one right now. The potential is high in this one, given anywhere from 6 months to... oh, I don't know... a couple years(?) to mellow. Awfully warm right now, which makes it a sipper that warrants nearly an hour to finish. If you're lucky enough to snag a bottle, do yourself a favor and sit on it til at least next fall... or if you like a boozy bourbon warmth, go ahead and have it right now! Growler provide the first night of Inflatablechair's annual hair-cutting extravaganza. Seanthornton152 brought this gem over just for the occasion.... Very cool Sean... Glad you entered this one in before I did... I definitely didn't think "RIS" .... I think American Strong does justice. Pours clear brown... nice off white head with okay lacing. Nose is a plush sugary caramel conglomeration soaked in good bourbon. :-) Lite cocoa shows too, but that could be my smeller playing tricks. Thick vanilla caramels... very malty and sweet.. not cloying.. just very thick.. decadent almost.. the bourbon plays pretty heavy too.. vanilla and lesser oak.. something that I pick up as spicy phenols... a bit solventy EtOH as it warms. Too sweet for my teeth. Body is pretty heavy .... carbonation is lite yet ever present even on later pours. Thanks again Sean.... I had a really hard time wrapping my mind around this one.... in a good way of course. On draught at The Beer Stein, Pappy's Dark is chestnut brown with a small off-white collar that leaves no lace. Smell is huge wet bourbon, not hot though, just the wonderful caramel/corn/vanilla notes, with a little bread pudding wafting out as it warms. Taste is raisin and fig, bourbon, chocolate. A nice earthy BSDA with some phenols and a big, yet smooth punch of bourbon flavor, without the overt booze. Mouthfeel is modestly dry, and surprisingly not to heavy, definitely bringing that Belgian style digestibility. Drinkability is very yummy, well integrated, dangerously smooth and delicious. I love bourbon, and love how reminiscent this is, without being as bruising. Bottle thanks to writerljberg for the bottle. Poured into snifter. A: Reddish amber with a small brown head. S: Caramel, toffee, brown sugar, bourbon, oak, coconut, date. Evident booze. Smells a bit like an old IPA with some barrel characteristics. T: Pretty hot. Earthy hops, caramel, oak, toffee, and lots of booze. Low bitterness. Finishes dry, with pronounced booze and oak. M: Upper medium in body with upper low carbonation. Mouthfeel is silky, smooth, and sticky. Overall: An interesting beer. Somewhere between an old Double IPA and a Barleywine. Not bad, but I wouldn't recommend it. 2010 vintage shared by Mike (AgentZero). Served in a Russian River tulip. A - Tan foam settles to wisps, a collar, and specks of lace. Opaque brown-orange body. Pretty solid considering the higher ABV. S - Malt-heavy, with cherry brandy, dark fruits, marmalade, bourbon, and oak as well. Even with all those sweet flavors it manages to avoid being cloying - the oak and whiskey bite help in that regard. T - A nice mix of fruity, toffee, and caramel malts yield to oak, vanilla, and bourbon in the finish. Notes of plums, black cherry, and raisins with some estery yeast as well - base felt a bit more like a Belgian Strong than an American one. Alcohol is very well hidden, and this went down fairly smooth for 10%. M - Smooth, medium-full body. Creamy texture that evokes liquid caramel. Lower but present carbonation and well-hidden alcohol. Not sure if this would have been as tame out of the gate, but it's quite ready at this stage of the game. D - A solid malt-forward barrel-aged beer. Nothing mind-blowing, but enjoyable all the same. You'll definitely need a few friends on deck to tackle the 750ml bottle, but it's perfectly drinkable in small doses. Thanks to jedwards for sharing this one. Pours the color of toffee with a hazy clarity. Head is just a soapy skim with a thin band around the edges. Nose is sugary and reveals toffee, citrus and a buttery quality. Taste expresses butterscotch, albeit it's a bit watered down, with just a suggestion of bourbon and a slight bitterness. Mouthfeel is medium-light in consistency with a sharp carbonation and a slightly oily texture; however, all and all, it comes off a bit watery. My overall impression of this beer is a thin old ale. All and all it's decent, but the mouthfeel makes it all just fall a little short for me. Pours a semi hazy medium brown colors with a small eggshell head that recedes to leave some decent lacing. Aromas begin with some brown sugar, caramelized sugars, light maple and candy with some emerging bourbon more and more as it warms. There is also some light oak and toasted bread which emerges as well. The tastes follow those nose with some toasted biscuity bread, caramelized sugars and light cocoa maltiness. The bourbon and oak complements the flavors and does not assert itself too much or overpower the base beer but works in harmony. Some vanilla and maple also emerges as it warms more and more. The mouthfeel is medium to heavy bodied with medium to light carbonation. Finish is decently sweet but no where near cloying thanks to what I assume is some Belgian yeast which adds some necessary dryness. Overall this is a fantastic beer and probably the darkhorse highlight of our last group bottle share. It is a beast flavor-wise yet extremely balanced and drinkable compared to other offerings in this ABV level and style. Definitely worth seeking out if you ask me. The beer appears a murky shade of burnt copper with virtually no head. The aroma offers oak, vanilla, bourbon, sweet malt. The flavor is very malty, with tannic / vanilla notes. Perhaps a hint of citrus from excessive barrel character. Light in feel with low carbonation. Overall, this was ok. 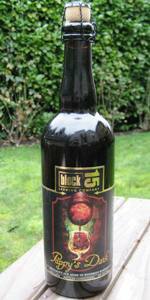 Thanks to kscaldef for sending me my first two bottles of Block 15, maybe the brewery I most wanted to try. This brew was on my list...so let's get to it. C&C 750 ML bottle split with my wife from the 2011 bottling. Nice label & good to see the eco-consciousness of another brewery. Pour looks like liquid caramel with redhead highlights. Smell unfolds as it warms. Great barrel notes, & enough hard malting to rival an old ale with that distinctive sweet caramel & booze. Very nice. Pappy's Dark punches like a beer twice its ABV & makes my breath a fire hazard. Not only smells like an old ale, tastes like one too: big caramel & a brick wall of booziness warm enough to make me kick off my slippers & abandon my sweatshirt. Lovely goose of vanilla & gentle bourbon hit the bare midriff (bare because my temp is still going up). End-up is woozy boozy with a touch of toffee, slight breadiness coming in & oak causing a drought in my mouth. Could use a touch of carbonation, but hey, hairs, split, etc. This is a low-fi bruiser that mimcs antifreeze (now I'm free of my pants, yippee!). If straight-up alcohol & complexity is your thing, you'll like this. Me? Love the complexities, very good beer.